Whenever I receive a new gadget I like to ride with it for a quite some time before I write a review. I like to test it over weeks or months to gauge its durability and performance in different conditions, but most of all I like to wait until the "wow factor" has worn off so I can give a purely subjective review. I've been riding with the Blaze Laserlight for almost a year now and the wow factor still hasn't worn off. The first things you notice as you unpack the Laserlight are its weight and build quality. The Laserlight has an aluminium casing and feels heavy in your hand immediately giving confidence in its durability and quality, no rattles and not a hint of flimsiness. The light mounts quickly to your handlebars requiring only a hex wrench and possibly one of the various width rubber spacer rings included. 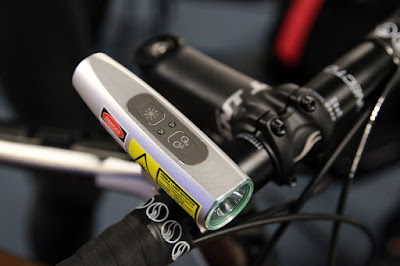 The light itself has three modes flashing 100 lumens, solid 100 or solid 300 and, in a stroke of design genius, when not mounted to the bicycle cycling through modes skips flashing mode because really when have you ever wanted a flashing mode when using your bicycle light as a torch? The unit is 100% waterproof something made possible by an ingenious magnetic charger much like Apples MagSafe connector rather than a standard USB port. But that's all great, what about the laser, you want to know about the laser right? Once mounted at the correct angle the Blaze Laserlight projects a bright green image of a bicycle onto the road ahead of you. The image is crisp and clear in dry conditions, but under bright city lights the image fades and in wet conditions the image all but disappears as the laser light is reflected off the road surface. The Blaze Laserlight signals your presence ahead of time. The image of the bicycle enters any intersection or jumps out from a blind corner meters ahead of you, letting everyone around know that you're not far behind, but surprisingly in all but a few cases motorists rarely reacted to the laser image which is rather disappointing. Where the Laserlight excelled beyond compare was when cycling amongst pedestrians, which in Tokyo is almost unavoidable. Unlike the ring of a bell, pedestrians react to the Laserlight immediately although their reactions can sometimes be unpredictable. Some stop dead trying to locate the source of the image which for some reason they believe must be above them as they peer into the sky. Others have almost been tripped by the beam of light as they skip, jump or hop out of range of the laser. Pets may be startled at the sight of the green bicycle mark, others will want to try and chase it as do small children so it pays to be well aware of the reactions you're likely to receive and cycle accordingly. Wait, didn't you mention Biblical Powers? What are these Biblical Powers? Somewhere in the Bible, closer to the front than the back, Noah led the Romans to safety from the pursuing Jewish tribes by parting the waves of the Red Sea using powers granted to him by the Tooth Fairy (or something like that). If you've ever cycled on he pavement in Japan you must know how difficult it can be to proceed any faster than walking pace, but when cycling amongst pedestrians with the Laserlight a path magically opens before you creating a safe corridor through which to cycle. It really is magic, you won't believe your eyes and I believe this is the greatest appeal of the product for me. Also the "wow factor". I cycle with the Blaze Laserlight every single day, and not a day goes by where without someone commenting on the light. "Wow! ", "Sugoi", "Kakkoii", "Cool", "What the f*ck" are all reactions I've had when cycling with the Laserlight. By its very unusual nature the light draws a LOT of attention and you'll be answering peoples questions whenever you're stopped at a traffic light. IN addition to this just seeing the light surprises people, makes them smile and laugh, and its great to be able to inject a little excitement and happiness into the lives of people as you pass. 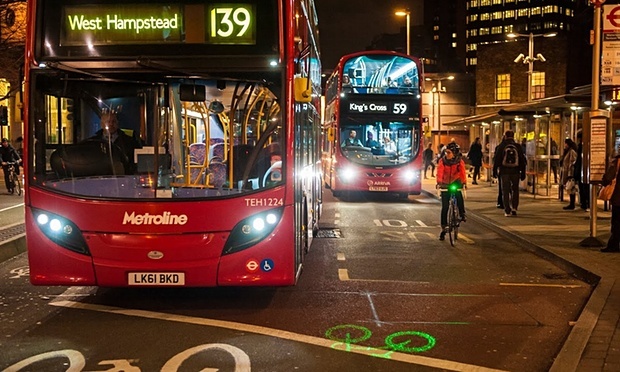 In summary the Blaze Laserlight is a quality product, and one which I'd recommend to anyone that finds themselves cycling amongst pedestrians or on roads crowded with other cyclists. As a light it performs exceptionally well with 100 lumens being more than adequate for city cycling, and 300 lumens for when you find yourself on a dark country road or cycling through a poorly lit park will see you through. The laser has mixed results in traffic, where largely ignored my motorists at intersections. But when cycling among pedestrians or other cyclists the Laserlight signals your presence ahead of time and practically demands attention and action and this is where I find the most value in the product to the point where I now feel more unsafe cycling around pedestrians without the Blaze Laserlight. For cycling in Tokyo and other Japanese cities the Blaze Laserlight is perfect!